Are you pressed for time? Having trouble getting all your fruits and vegetables in? Looking for an energy boost or want glowing skin? In a matter of seconds you can whip up a fresh and tasty fruit and vegetable smoothie. Not only do these Superfood drinks help satisfy your fruit and vegetable requirements for the day, they are packed with antioxidants that have amazing health benefits. 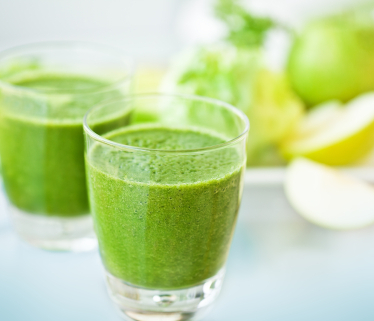 Here are some tips on how to experiment with different smoothie recipes with an emphasis on greens. choose a liquid base: water, coconut water, low fat milk, unsweetened almond milk, unsweetened coconut milk, light soy milk, or non fat yogurt. May choose plain or vanilla flavored milks and yogurts. Stay away from juices which tend to have added sugars and unwanted calories. Almond, soy, and coconut milk are lactose free options if you have lactose intolerance. Water is an option if you don’t care for milk. choose 2 fruits (fresh or frozen): apple, banana, blueberries, strawberries, raspberries, blackberries, peach, pear, pineapple, orange, or mango. choose 2 green vegetables: romaine lettuce, baby spinach, arugula, collard greens, kale (stems removed), celery, cucumber, parsley, cilantro, mint, basil, etc. optional additions: ice, lemon juice, lime juice, apple cider vinegar, cinnamon, stevia, unsweetened pure cocoa powder, almond butter, natural peanut butter, wheat grass powder, whey protein powder, ground flaxseed, hemp seeds, chia seeds, raw wheat germ, bee pollen, aloe vera juice, or omega 3 fish oil. Be sure to wash all fruits and vegetable thoroughly. Combine all desired ingredients in a high powered blender and blend until smooth. Serve immediately or refrigerate if desired. If you don’t care the first smoothie you make, try a different combination next time until you find one that you enjoy. Feel free to experiment. Don’t worry, the fruit and the milk (especially the vanilla flavored) conceal the taste of the green vegetables, so you won’t even taste it! Bon appetite!